What is Immunotherapy for Lung Cancer and How Does it Work? This treatment utilizes a person’s own immune response to treat their disease. Our immune systems work around the clock protecting our bodies from “foreign” substances such as bacteria and viruses. We know that this immune “surveillance” also protects us from cancer, by recognizing a cell that has become cancerous as something foreign. When this surveillance system fails, cancers begin to grow. An everyday example of this process occurring naturally is in the case of pregnancy…this is the mechanism by which a fetus can grow in a woman’s body without being identified as foreign and hence being attacked. How do cancers evade our immune system? Spontaneous mutations in the genes of a cancer cell cause the cells to be altered in such a way that they can no longer be recognized by our bodies as something foreign. They can also produce substances or proteins that can shield them from immune attack, as outlined below. Meet Dr. Julie Brahmer, global thought leader in the emerging field of immunotherapy. A patient’s cancer cell can have on its surface a complex molecule that activates the PD-1 receptor on a patient’s T-cells. This linkage (or “bond”) then prevents their T-cells from doing their job. 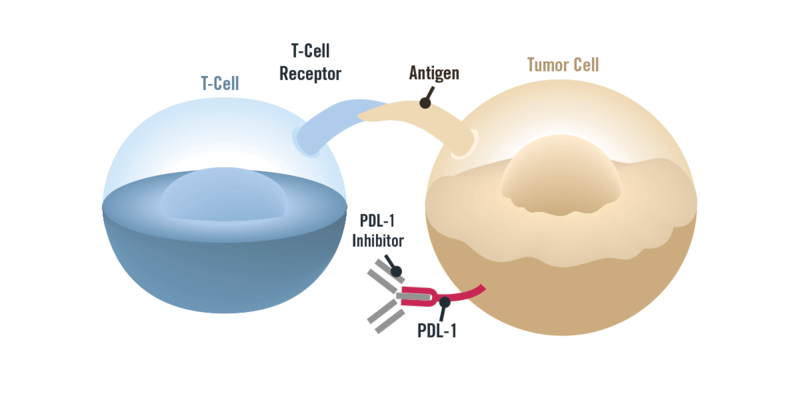 Drugs known as “ANTI-PD-L1” break that bond which then allows the tumor cells to be attacked by T-cells. 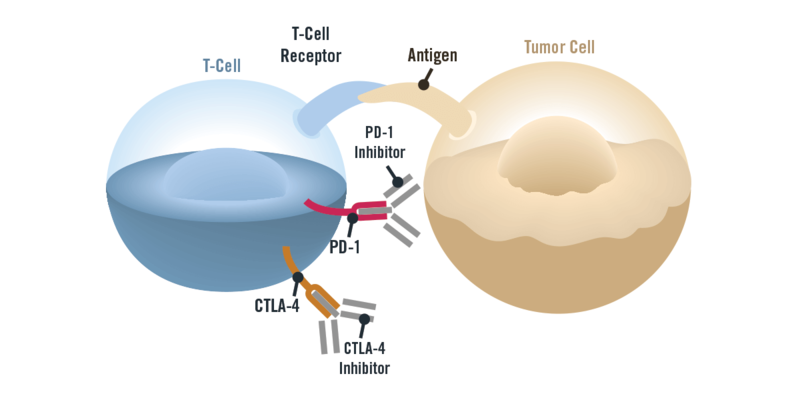 A patient’s cancer can express molecules that activate PD-1 or CTLA-4 inhibitory “receptors” on their “T-cells” or other cells in the immune system. T-cells are the cells in our immune system that ordinarily fight cancer. When these receptors are activated on the T-cells, they are prevented from attacking the cancer cells. Drugs known as “ANTI PD-1” and “Anti-CTLA-4” work to “release the brakes” – allowing the cancer cells to be detected and attacked by T-cells. A very important finding about immunotherapy is that when a patient responds to the treatment, the response can last longer than conventional chemotherapy…on the order of 1-2 years rather than 1-2 months. Scientists are studying why some patients’ cancers respond, as well as why other patients’ cancers do not. Combinations of these drugs with chemotherapy and/or other targeted therapies are also being investigated and appear extremely promising. Ask your oncologist about the latest advancements in immunotherapy treatment for lung cancer. Cancer cells are the teenagers of cells… they’re pretty normal, but they behave badly.